Saturday, May 21st dawned crystal clear, gorgeous. If we were looking for a sign, this was it. 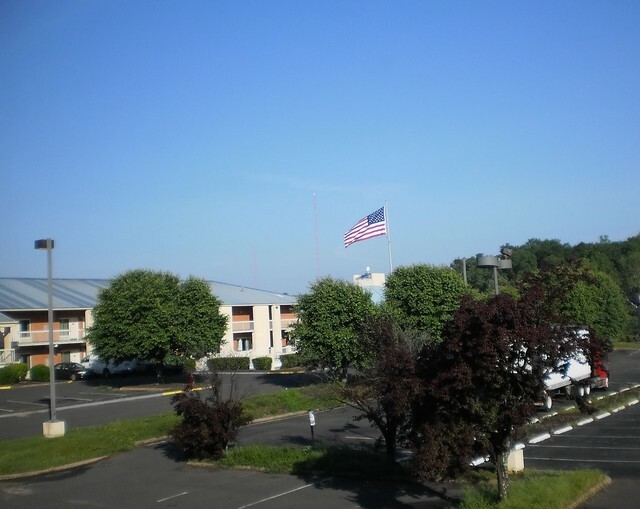 Not a cloud in the sky. A light breeze and mild temperatures. After breakfast, we drove out to the farm. Carole and her bridesmaids had been up early finishing the last of the decorating. There were bows to put on the porch. Each table had to have the bag with decorations and the appropriate camera so the caterer could then set things out. The arch was brought out of the barn and stuck into the ground. It had white lights on it so the extension cord had to be anchored. 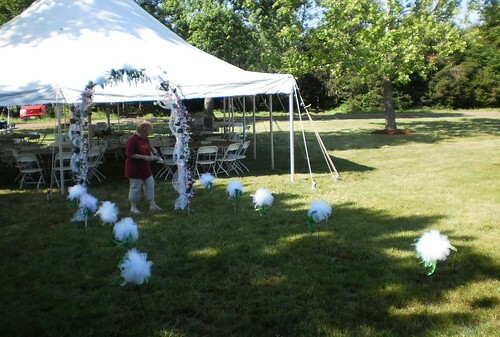 Then, these tulle flowers were placed along the path from the house to the arch. Carole and Michelle had gone to pick up the cake and the flowers. 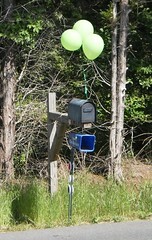 When they got back, mom and I were charged with putting balloons on the mailbox and on the sign to the farm. Hop in the car and off we went. First stop was the mailbox. In the early morning, the mailbox is in full sun. By afternoon, however, it's in complete shade. When we left the reception to head back to the hotel in the early evening, the balloons on the mailbox were still floating. They were slightly diminished in size, but they were still floating. 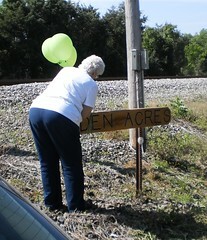 After decorating the mailbox, mom tied balloons to the farm sign. Because these were always in the sun, by the time we got back from the church, they were drifting just above the sign and weren't even floating at the end of the reception. 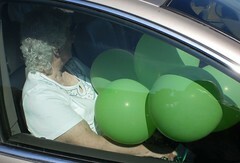 I heard someone at the church say, "Just drive down Remington Road and look for the balloons." You could still look for the balloons on Sunday but they weren't floating. What's more festive than balloons? I know all the stuff about letting balloons go and having wildlife eat them with disastrous results, but used to decorate, balloons just say "Party's here!" Back to the house we went. It was then we discovered a couple of oopses. The cake traveled from Safeway (Yes, a grocery store! It was excellent cake!) in a large box. It was three tiers topped with a white tulle ribbon and white silk flowers. The top tier was white frosting with green dots and shamrocks. 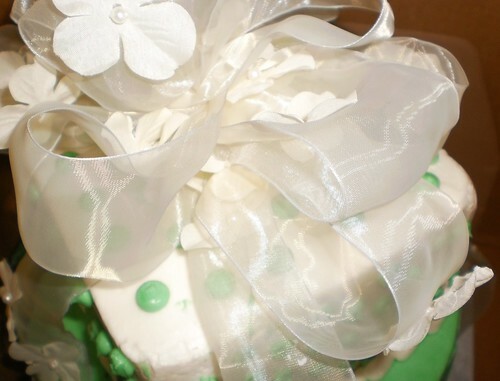 The middle tier was green with white and the bottom tier was white with green. A small part of the side of the cake, to the left in the photo and you can't see it, had touched the side of the box as Carole and Michelle drove back from the store. Carole was upset but, as we looked at the damage, we realized the caterer had probably seen worse and they would be able to "fix" it, although a couple of the decorations on the side had been smushed. Another problem was with the flowers. This bowl of roses was a centerpiece. It was beautiful but had spilled into the box with the rest of the flowers. Oh well, we scrounged around for a tub to put the rest of the church flowers in. Carole selected potted orchids. 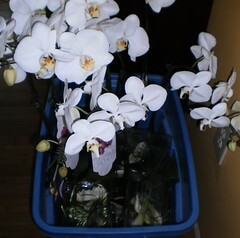 We were able to find a plastic bin and the orchids all fit inside the bin. They were so pretty. The big problem was with the calla lilies. Each groomsman and the fathers had a single calla lily as a corsage. 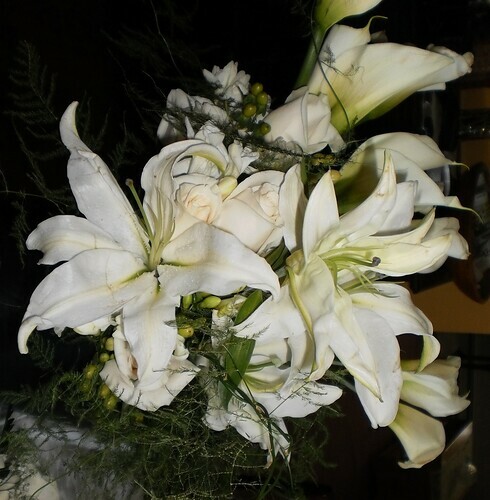 The bridesmaids carried a bouquet of three calla lilies tied with green ribbon. David had a white rose. 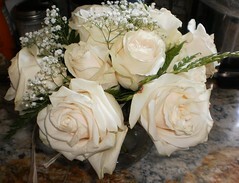 We moms and my mother had a corsage of one white rose surrounded by greens and white miniature orchids. Carole was supposed to get 15 "perfect" calla lilies. When she got to the florist, also in the Safeway grocery, she found out the supplier had sent 25 lilies of which only 3 would pass the florist's "perfect" standard. The florist had taken a scissors to some of the lilies but even the ones she had pruned of the dried brown did not meet what anyone would consider perfect. Carole was unhappy. The florist, however, substantially reduced the cost of the flowers. In reality, flowers are just accessories to the event. While they complimented the activity, no one was walking up to someone and critically looking at the flowers. It was distressing that things were not exactly as Carole envisioned but the flowers were gorgeous. All the decorating done. Everything else fetched. David and the groomsmen were getting their tuxes and were dressing at the hotel. 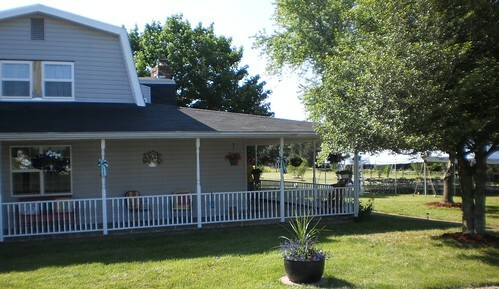 We had a few minutes to sit on the porch and collect our thoughts. We were finally at that day, the day 2 people who loved each other deeply had chosen to start their journey of forever.